petergrovesblog | This is the entry portal to the website www.petergroveswebsite.com. This is the entry portal to the website www.petergroveswebsite.com. Here are some of my most recent UK hikes and activities from 2018. Some walks are concentrated in North Hertfordshire, not far from Royston however some walks are located further afield along the North and South Downs. Please follow the links to each Photo Album. The end of the year was fast approaching and with the onset of winter though by all accounts, a mild one, as global warming becomes a fact of life. Time to get in one or two last walks before heading off to Cape Town and warmer climes. I drove to the village of Barkway not far from Royston, choosing a walk I had done before in many guises. Leaving my car on the High Street in town near the war memorial, I headed east past the sports grounds and along the northern edge of Earl’s Wood towards Nuthampstead, emerging at Park Farm Lane in Little Cokenach. Around 6,000 medieval moated sites have been identified in England and Cokenach is the location of one such site. The path continues behind The Woodman pub off Bell Lane and heads towards a landing strip on the eastern border of Hertfordshire into Essex, which served as a former Royal Air Force station for RAF Nuthampstead. I drove into Baldock on this Saturday morning to pay a visit to Chapmans, a butcher that sells a variety of my favourite South African food products, such as Ouma rusks and Pronutro breakfast cereal. They also make their own biltong and dried boerewors. I had planned a walk after and discovered a car park at Hatch Lane, off London Road, in the Weston Hills Reserve. The weather wasn’t the greatest so I decided to take in the neighbouring village of Weston itself, crossing the A505 Baldock bypass on the Weston side of the tunnel. At Church End, I headed up the lane to the Holy Trinity Church, the parish church for the village of Weston. The church building stands to the south-east of the village on high ground, and is built of flint and coursed ironstone rubble. It was Grade I listed in 1968 and the the supposed grave of the giant Jack o’Legs is in its churchyard. 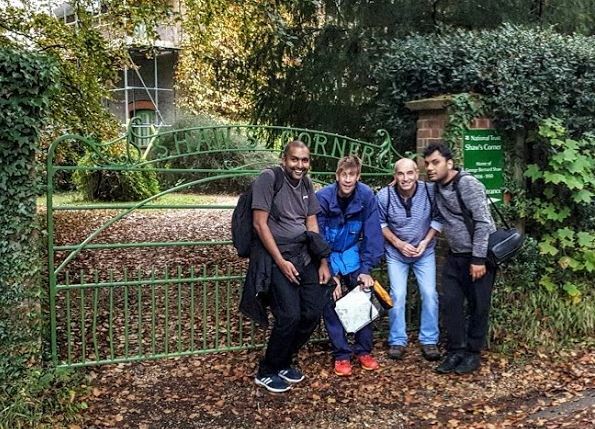 A few days after my walk via Ayot St Lawrence and the disused Ayot Green way rail track from the village of Codicotte, it was time to take my colleagues from our HCL office on a shorter jaunt that overlapped that route, to some extent at least. Although the clocks had not yet gone back, we would still be constrained by the amount of available light, having left the office around mid afternoon. The planned route was to drive to a parking spot near the disused rail track at Ayot Little Green, just outside Welwyn Garden City, then set off past the Waggoners pub towards Brockett Hall, former home of the British Prime Ministers Lord Melbourne and Lord Palmerston, now a golf course. We were warned off by the groundsman for veering off course(!) but crossed the River Lea via the bridge at the weir in Brockett Park, near Lemsford. This a new route uncovered on a gloriously yet unusually sunny Autumnal day, starting out from the village of Little Wymondley, located on the opposite side of the A1(M) highway from Stevenage, in Hertfordshire. At the edge of Hitch Wood, where the path crosses the B651 once more (on the Whitwell Road), lies an ornate gated entrance to a large estate which is home to the Sue Ryder Care Home, in the village of St Paul’s Walden. Stagenhoe is a Grade II listed stately home, with its surrounding gardens and is one of two large manors with fine grounds in the village, the other being the historic home of the Bowes-Lyon family St Paul’s Walden Bury. Notable members of the family include the Queen Mother, born Elizabeth Bowes Lyon, mother of Elizabeth II; she was baptized in the All Saints church in St Paul’s Walden. My good buddy Zoltan, based in Zurich, had flown over for the weekend for a Rick Wakeman piano concert at the Derngate Theatre in Northampton on the Friday. A walk Saturday was in the offing and I proposed a repeat of the circular walk I had enjoyed immensely a few months back i.e. Codicote – Ayot St Lawrence via Ayot Green’s disused rail track and back. At the taile end of the walk, we stopped for half a pint of cider at the Brocket Arms pub in Ayot St Lawrence, Zoltan not wishing “to get drunken”, as he would put it. In the fading light, we needed to crack on. Just as we left the village and picked up The Hertfordshire Way path heading north towards Codicotte, we heard a sudden crashing noise close by. A huge tree had fallen over just off a gravel track from the direction of Kimpton Mill. A cloud of dust descended into the air and birds took flight in panic. We reached Codicotte and stopped off at the Bell Motel on the High Street of Codicotte for further refreshment. It was with great sadness that we learnt of the passing of Tom Schumann on 13th June, 2018, after a long, courageous battle with cancer. Tom’s widow Karin, along with her daughter Sarah had planned to visit her son Tim, an architect based in London. It was with therefore a privilege to have them as guests in Royston for couple of days. They had travelled up from London on the morning of 26th September to Cambridge, where they had spent the day. I had arranged to pick them up at Royston station. The evening was spent having dinner at the Fox and Duck Restaurant in Therfield. Having taken leave for the next day, I suggested an impromptu tour of a few villages in North Hertfordshire, not far from Royston. On a fantastically warm day in late Autumn, I met up with my friend Tammy for an 11 mile walk on the North Downs from Shoreham, Kent today, accompanied by Alfie the Labrador, whose owner is one of her neighbours. A detour took us to the Rising Sun, a ramshackle pub, if ever there was one. Alfie the Labrador is a dog like no other, possessing an insatiable appetite, hoovering up any variety of food en route. Fallen, rotting apples, discarded old bones, nothing escaped consumption. Having ordered beers which we were to enjoy in the sunshine in the back garden, Alfie made a beeline for the garden table at which some folk had just been eating. Without hesitation, the hound leapt onto the table to grab a left-over sandwich, much to our embarrassment. Tammy had brought along some dog treats however these were chicken feed compared to what had been consumed. Not far from Bishop Stortford near Stansted Airport, this walk involved crossing the border between Hertfordshire and Essex. Patmore Heath, a 7.6 hectare biological Site of Special Scientific Interest in East Hertfordshire caught my eye as I was driving around looking for a starting point in an area I was unfamiliar with and had not walked before. The site was notified in 1985 under the Wildlife and Countryside Act 1981. It is home to a large amount of dry grass, as well as marshy-areas. Some really gorgeous houses are located around the heath in a way that gives the area an air of a real country village bereft of too much planning; the sort of place where you’d like your kids to grow up in. 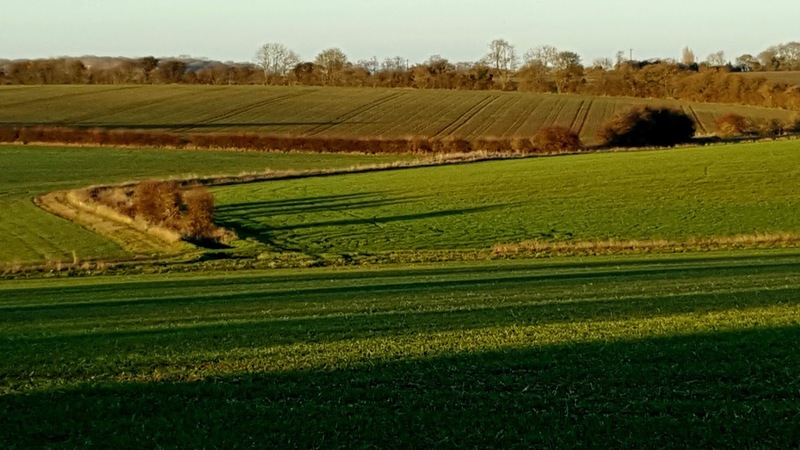 It was a warm day in August during a heat wave that lasted several months in the summer of 2018, throughout the 2018 World Cup tournament in Russia, The green belt east of Hatfield and south of the A414 in Hertfordshire had long since attracted my attention. Essendon is a village and civil parish in Hertfordshire 6 miles, south-west of Hertford. The village has a view of the Lea river valley to the north, as it flows between Welwyn Garden City and Hertford. Although on an ancient site, St Mary’s parish church in the town dates mainly from the 17th and 18th centuries and was restored in 1883. It was here that I engaged in conversation with someone attending to a parent’s grave, to determine where to pick up the start of the path at the rear of a residential area. This walk from the Hertfordshire village of Codicotte, just outside old Welwyn, where I lived when I first arrived in the United Kingdom in 2001, at the tail end of a lengthy season of unusually hot summer days, turned out to be one of the nicest, most picturesque routes I have done in a long time, lasting more than 6 hours, taking in much in the way of history. It was late afternoon between four and five o’clock that I reached the starting point of my walk and felt I had earned a drink or two at the Bell Motel on the High Street of Codicotte. The town was on one of my favourite cycle routes from old Welwyn towards Peters Green via Kimpton. In fact, I recall popping in to watch a live broadcast of a World Cup 50 overs cricket match between an England side featuring Kevin Pieterson and a South African led by Hansie Cronje prior to the scandal that ended the latter captain’s career. South Africa won that match. An Easter weekend Kent walk on 1st April with my friend Tammy, who hails from Eltham, south London, starting out at Pedham Place Golf Centre, a total of ten miles.The Darent valley was one of the major areas of Stone Age settlement however Shoreham is not mentioned in the Domesday Book. The village was the birthplace and home of Private Thomas Highgate, who was the first British soldier to be shot for desertion during the First World War on 8 September 1914, following the Battle of and Retreat from Mons. It was the most bombed village in the United Kingdom during the Second World War because the Army took over several manor houses for operational use. 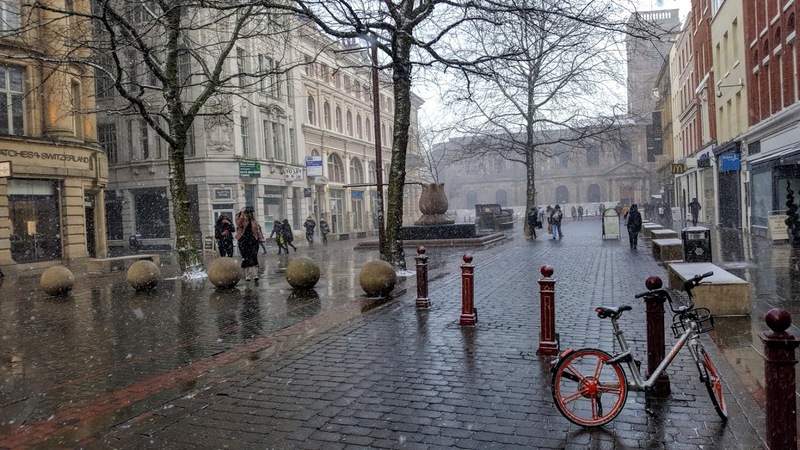 The cold spell enveloping the United Kingdom at the end of February – start of March brought with it snow, though with more severity elsewhere than it did in north Hertfordshire. By Sunday the thawing had begun as temperatures began to rise and a walk was in the offing. Muddy conditions prevailed. 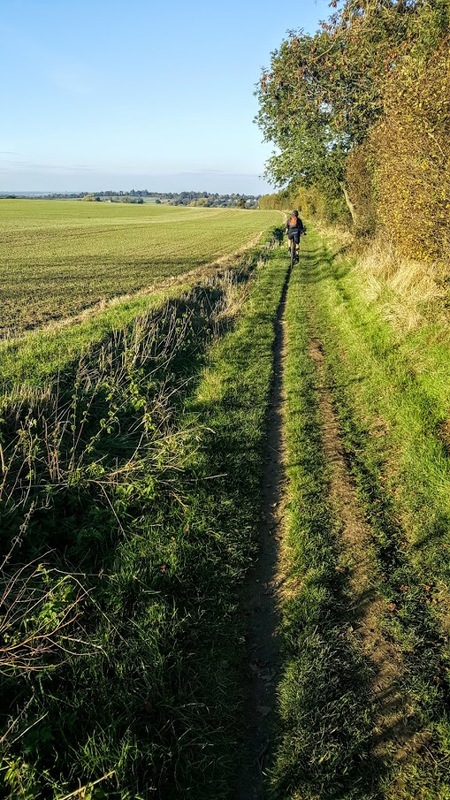 The circular route is one I’ve done many a time, from Royston to Reed along the Greenwich Meridian, across the A10 and back via Therfield along the bridleway into Royston. Persistent rain and extreme cold rendered any form of outdoor activity an unpleasant experience. Sunday 11th February 2018 gave way to sunny skies despite the cold. Decided on a walk from the village of Barley just outside Royston, north Hertfordshire, heading south along mostly farmland towards Nuthampstead, before turning west through Cokenach (farm) and into Barkway. Early in the walk I encountered the local cricket clubhouse at Barley, the existence of which I was unaware of. In the end, a rather pleasant 3-4 hour walk with the bonus of spotting deer trouping across the fields at Cokenach Estate. It might have been around 5 degrees Celsius but that’s not to say it can’t be fixed by a flask of hot tea and the occasions when the sun managed to escape from behind the clouds rolling in from the south-west! 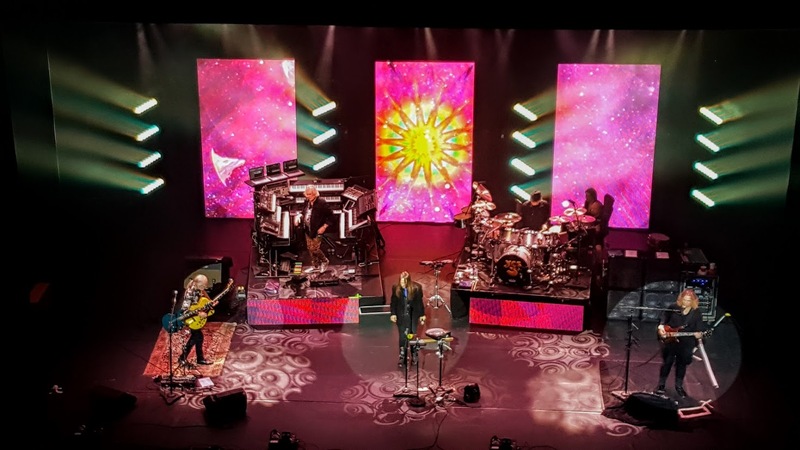 It’s quite unbelievable to think that a band of artists can embark on a tour in what is their 50th anniversary year, playing a genre of music known as progressive rock, so far removed from mainstream pop. 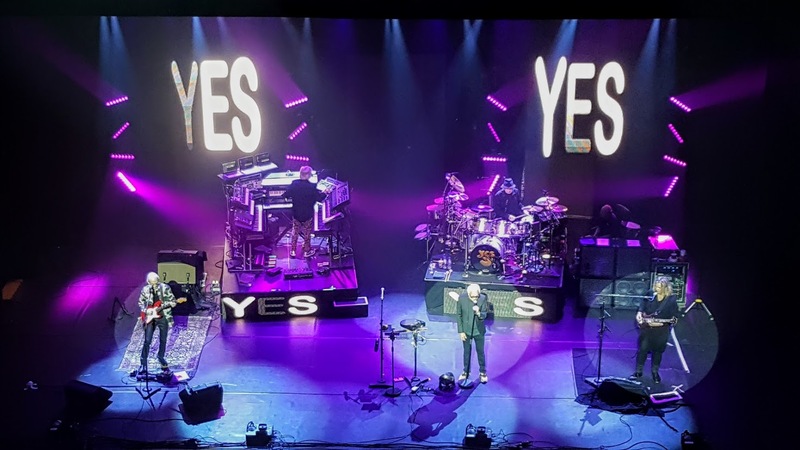 I have followed YES since 1971 and have never tired of their music, whilst having enjoyed and appreciated many other bands and musical styles. To have sustained the high levels of interest and creativity for that period of time is quite remarkable, particularly….. And what better venue to enjoy them than the London Palladium, built in 1910, arguably the most famous theatre in London and the United Kingdom, especially for musical variety shows. Indeed, several of my grandfather’s brothers as well as his own father work in the theatre in London around that time and may have set foot in this hallowed establishment. Sitting in the upper circle among the paper bag rustlers however, I felt at times like a contortionist doing a Houdini impersonation. It’s a beautiful theatre but the lack of leg-room makes for an uncomfortable few hours. At least my mind was distracted thoughout for the two or so hours by what was happening on stage, as I found myself utterly engrossed entirely by the performance by a truly wonderful set of musicians. 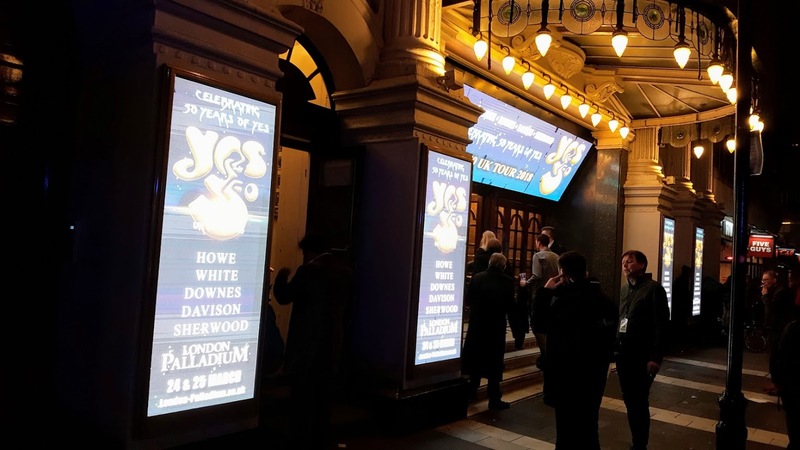 YES has been through many line-ups, some more controversial than others, the current representation being no exception. It may not be the classic early 70’s line-up but they still deliver a flawless performance with gusto and professionalism. The fact that their are two incarnations of the band for fans to squabble over testifies to their popularity. Much of what has been said written by so-called fans in attacking certain members of the band has been vitriolic, childish in the extreme and downright personal. There is not much that can be done to bring back the late Chris Squire, legendary bass guitarist, who, until his untimely and sad passing in June 2015, was the only member of the band to have played on all their studio albums and to have taken part in every single tour. It was a personal Squire request before he died to have his longtime collaborator Billy Sherwood, who played with him on side projects, take over the mantle and fill his huge boots. In terms of his playing style I think he is a natural successor, apart from the fact that he was very much part of the band in the late 1990’s. 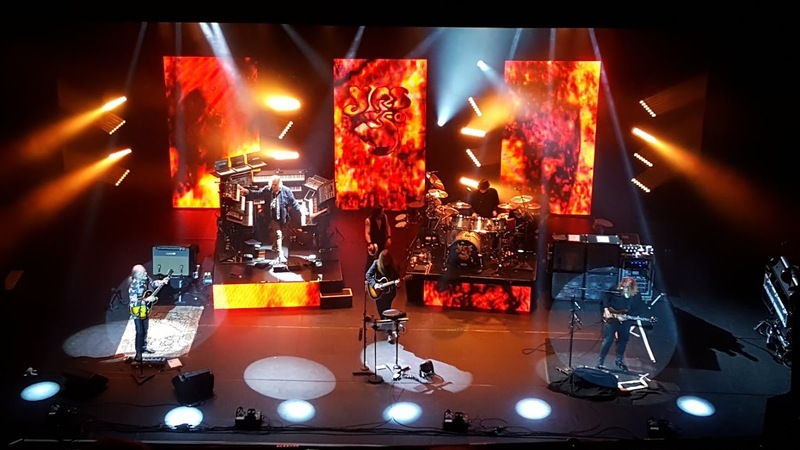 The sound at the London Palladium was magnificent and the band were cooking, to put it mildly. The stage lighting too was superb. In many respects I enjoyed the show more than the one a week ago at the Bridgewater Hall in Manchester, where I sat in the 3rd row centre. For one thing, the sound up in the rafters was more balanced notwithstanding that I could discern the various instruments more easily. For the show up north, I felt that the keyboards seemed too low in the mix at times and the bass was muddy. There is no question that guitarist Steve Howe is the driving force behind the band and one of the reasons I prefer this line-up to that of ARW, whom I saw late last year, featuring founder member and lead singer Jon Anderson, along with keyboardist Rick Wakeman and 80’s guitarist Trevor Rabin, the latter a fellow countryman of mine. Firstly, the current line-up that includes keyboardist Geoff Downes, has provided an opportunity to hear music from Drama, which I happen to like very much. 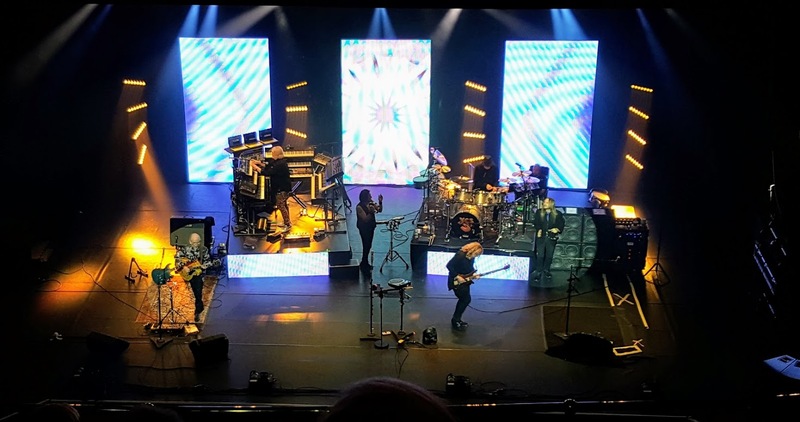 It was a real treat to hear Trevor Horn guest on Tempus Fugit during last night’s encore (Onward was dropped from the setlist as a result). It is a fact that Jon Anderson has in the past refused to perform anything from that album. I also feel inclined to want to hear some of YES’s arguably challenging but unquestionably more controversial work such as Tales from Topographic Oceans and possibly Relayer (rumour has it that keyboardist Patrick Moraz may feature in some capacity in future, possibly on the next American tour), which Rick Wakeman is reluctant to perform, having left the band in 1974 due to his lack of enthusiasm for that material. 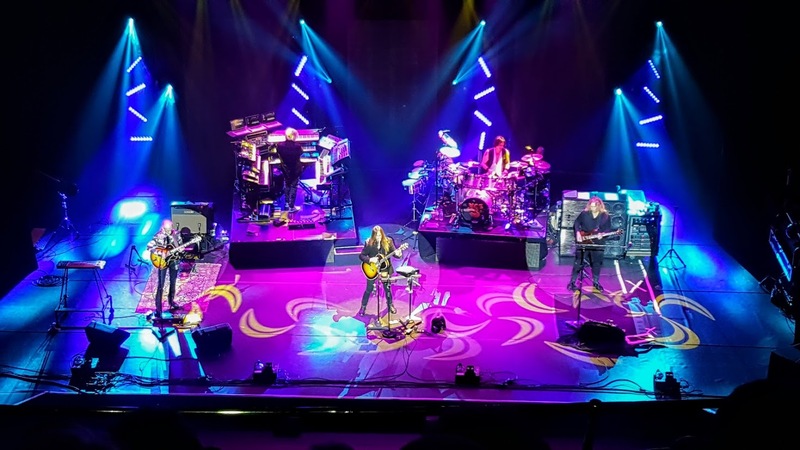 Whilst I do enjoy YES’s more commercial Rabin-era music and shorter song format (apart from Talk, which ventured more towards epic-style compositions), I prefer the other material, which I have more desire to see performed live, Talk aside. Having said that, I would go and see both bands. 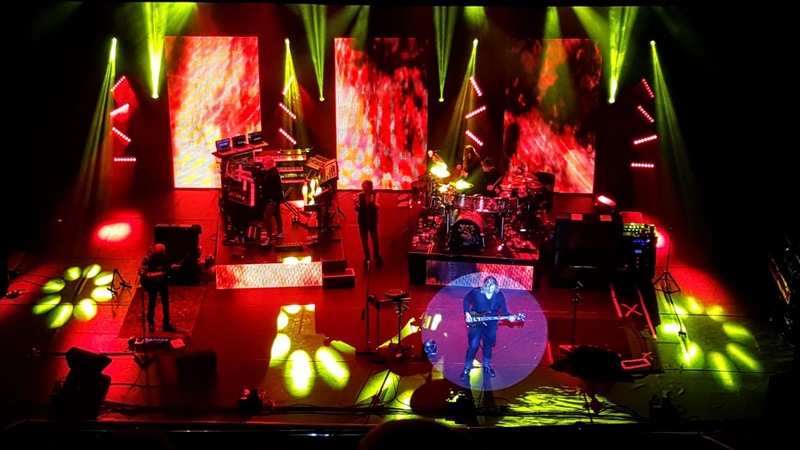 The rearrangement of classic-era YES songs for ARW’s live performances represented too much of a departure from the original sound, much of which I simply wasn’t too enamored with. Though the idea of re-interpreting the songs is an exciting prospect in itself, I found the sound and arrangements too cluttered and congested at times, with Rick and Trevor soloing full tilt. The simple fact is that my preference is to hear YES music sound as close to the original as possible, which is purely a personal choice. The fact that YES-official are deemed copy-cats by fans who despise the line-up I see as a complement in some respects. The complexity of YES music is such that it takes incredible skill to replicate the parts. Whilst Trevor is a great guitarist, personally, I love Steve’s unique guitar sound, instrumentation and style too much. On other fronts, I do miss Rick’s showmanship and personality. There is no question that he is a better keyboardist and soloist than Geoff, though the latter is a great keyboard player in his own right. 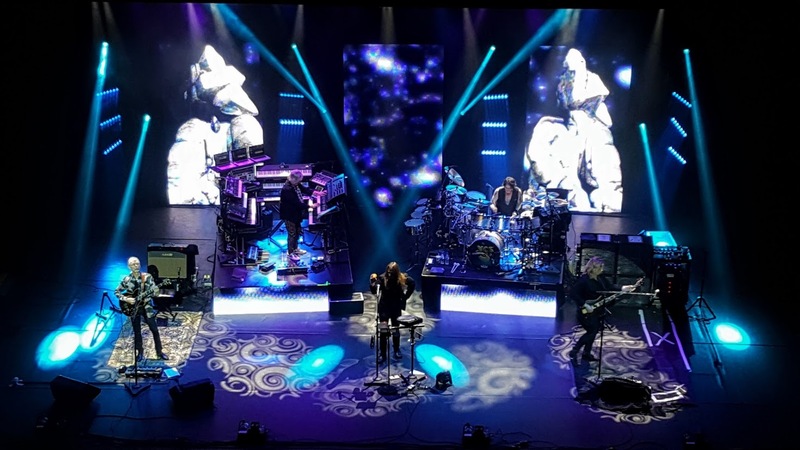 In some respects, what can be said of lead singer Jon Davison is that, paradoxically, he has on one hand found himself in right place at the right time but at the same time not. Allow me to explain. 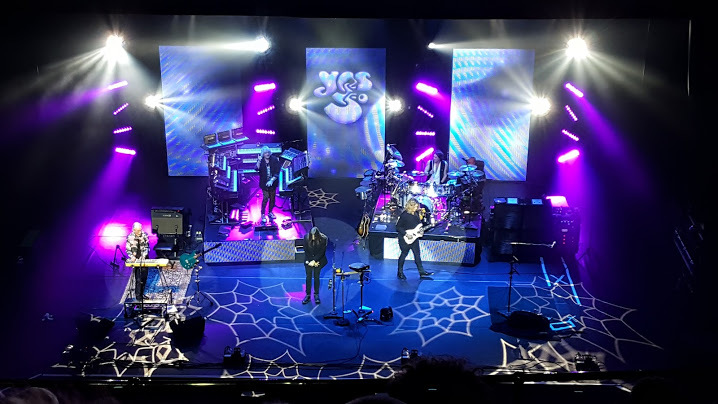 Due initially to founder-member Jon Anderson’s ill-health at the time (roughly 2004) leading to subsequent tensions when Chris Squire was still in the band, Jon Davison was asked to join YES. Jon Anderson has over the years been my favourite singer by a mile. The fact is that the American, more than any other singer, looks and sounds much like Anderson in so many ways most of the time. I shut my eyes during the rendition just before interval last night of And You and I and swore I was listening to Anderson. 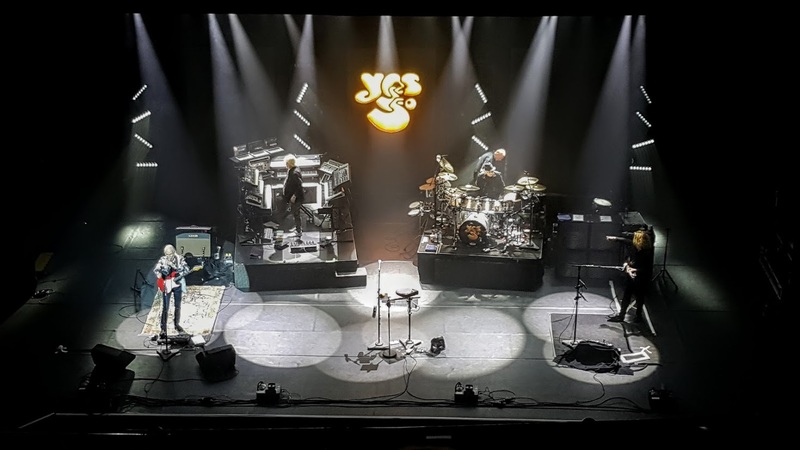 Until such time as the current line-up of YES release an album of music worthy enough to join the ranks of YES’s classic albums, undoubtedly a daunting and possibly impossible task, replicating rather than replacing the legendary and much loved Lancastrian remains Davison’s role in the band for the forseeable future. I do think he is a truly fine singer and performer. Heaven and Earth certainly has its moments but would have benefited from more time and refinement. It is improbable that a healing of the ways and reconciliation between the respective parties is likely at any time in the near future. Jon Anderson’s voice is still in fine fettle. He is 73 though and certainly not immortal, though his popularity seems that way. His frailty is such that lengthy tour appearances are likely to become more limited as time goes by. My hope is that to be fortunate to hear more great YES music in years to come, regardless of the line-up. 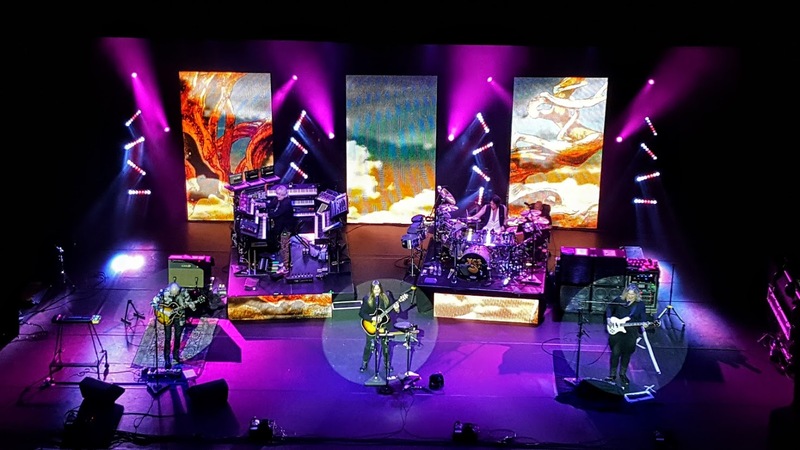 Progressive rock band YES embarked on a 50th anniversary tour for March 2018. Subsequent to my booking for one of two shows at London’s hallowed Palladium, a prime seat in C row middle became available for the Bridgewater Hall concert in Manchester, which I found hard-pressed to pass up on. Attending several shows is not an unusual idiosyncrasy amongst the YES fanbase. After a positive AirBnb experience in Berlin, I opted for the same on this occasion, coupled with the decision to travel up by coach Saturday, back on Sunday, in order to keep costs to a minimum. A return of the extreme weather conditions associated with the Arctic Beast lashing the United Kingdom once more in the space of a week, may have resulted in some logistic issues however it all panned out well in the end, despite the early 5 o’clock start Saturday with a 6 a.m. train into the capital. which threatened to get out of hand when the activists and and a passerby began trading insults. I was pleasantly surprised to discover some truly exquisite architecture. The Royal Exchange was one of the world’s centres for cotton trade until the Second World War, when the building took a direct hit during the Manchester blitz. Reduced in size but not stature, the Hall was repaired and saw continued trade until 1968. In the 18th century the trade was part of part the slave trade in which African slaves were transported to America where the cotton was grown and then exported to Liverpool where the raw cotton was sold. The raw cotton was then processed in Manchester and the surrounding the cotton towns and Manchester Royal Exchange traded in spun yarn and finished goods throughout the world. Threatened with demolition, the building remained empty until 1973 when it converted to house a theatre company. It was damaged on 15 June 1996 when an IRA bomb exploded in Corporation Street less than 50 yards away. After repairs taking over two years at a cost of £32 million, the refurbished theatre re-opened on 30 November 1998. The theatre was repaired and provided with a second performance space, the Studio, a bookshop, craft shop, restaurant, bars and rooms for corporate hospitality. One can still however see the original trading board with the day’s closing figures. Manchester Cathedral is an absolute gem and I spent an inordinate amount of time photographing the nave from various angles. Although there is evidence of an early Saxon church in Manchester in the form of the Angel Stone, dated to around 700, which was discovered embedded in the wall of the original South Porch of the Cathedral in the 19th century. The present church was built beside the manor house – now part of Chetham’s School of Music on the site of Manchester Castle, around 1215. The church became a cathedral in 1847, when the Diocese of Manchester was created. During the Manchester Blitz in 1940, a German bomb severely damaged the cathedral. It took almost 20 years to complete the repairs. All the Victorian stained glass was destroyed but replaced over several decades. 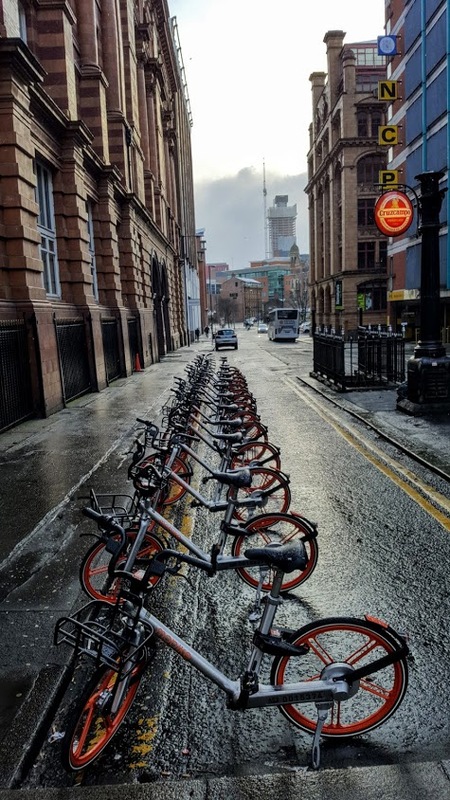 The AirBnb I had booked was situated at least 30-40 minutes’ walk south of the city, off Princess Street. The owners being away, I located it before the evening concert, in order to freshen up. The Bridgewater Hall, venue for the concert, cost around £42 million to build and currently hosts over 250 performances a year. The hall is home to The Hallé orchestra, and is the primary concert venue for the BBC Philharmonic Orchestra. I’m not fully convinced the sound was of the best from my vantage point – Geoff Downes’ keyboards seemed low in the mix. YES played for over two hours and was well received by the enthusiastic audience of die-hards. I particularly enjoyed the second half of the show, which featured two sides of 1974’s controversial Tales From Topographic Oceans. A visit to the merchandise stand at the interval dented my wallet a tad – the 50th anniversary program resembles a book, more than anything. Like most cities in the north of England, the streets come alive at night as the multitude of clubs in the city are besieged by teenage revelers. I’m always astounded as to how scantily clad girls are willing to pay the price in order to withstand the extreme cold, in order to look the part. It was the final fixture of the Six Nations 2018 rugby season and Ireland, who had already secured the tournament, were playing hosts to England. This being St Patrick’s Day, the city was also crawling with Irish wearing all sorts of green attire commemorating a holiday steeped in tradition, whilst celebrating the fact that they had got one over the English. A huge tent had been erected outside the town hall, where the match was being broadcast. The Western Cape and in particular the city of Cape Town is currently in the midst of a water crises as a result of the worst drought in decades. Ralph suggested a walk starting in Gordon’s Bay running directly up into the Hottentots Holland mountain range towering above the town, along a fire break. It’s quite steep and not a recognised path. The town lies on False Bay about 50 km from Cape Town. The first thing anyone approaching Gordon’s Bay sees is the giant anchor of whitewashed stones and the initials GB on the mountainside overlooking the harbour. The rocks that form these were originally painted by students in 1949, a year after the General Botha SA Nautical College was established. The initials therefore do not stand for Gordon’s Bay. Ralph and I effectively climbed past this landmark and up a gully to the top of the mountainside, an ascent of some 450 metres. Much of the vegetation had been burnt bare in a recent fire, the landscape resembling a wasteland. Continuing on we reached a jeep track of cleared fynbos which joins up with the tarred road inside the Steenbras Dam area. Whilst difficult to judge water levels by eye, at the time of writing the lower Steenbras Dam was officially just over 50% full. Low cloud moving in from the north-west, an indication of pending rain for New Years Eve, enveloped the wilderness landscape with an imposing sense of gloom. My annual holidays in South Africa almost always involves extensive hiking activity, often with my friend from school days, Ralph Pina. 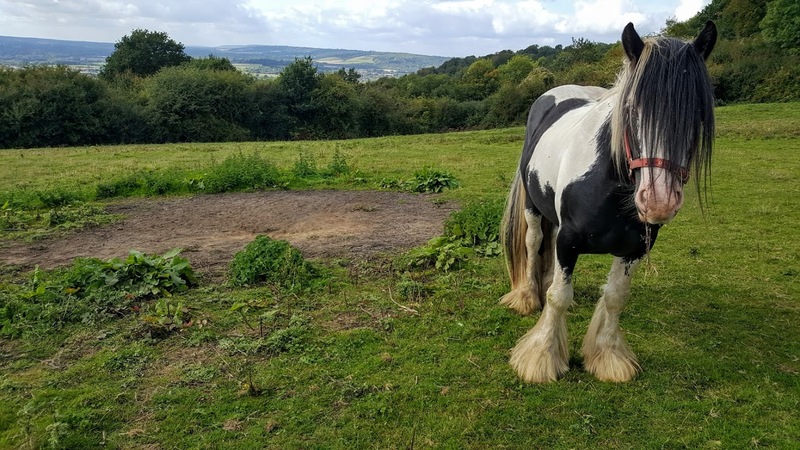 Despite being married with children with children, Ralph has the luxury and freedom of being able to disappear into the country, whilst also sharing some activities with the family. December 2017 saw us off to the Cedarberg Sandrif and Algeria camp sites for 4-5 days of hiking, which included a possible overnight at the Maltese Cross. The Cedarberg is a dry wilderness of spectacular beauty. The first night was spent at the beautiful campsite at Sandrif, accessed by road via Ceres and Op die Berg. Early the second day we set off on a walk to the Maltese Cross, having parked at the entrance to the reserve. Once there, we met up with three members of CALDI, a UCT-based group studying African languages and we learnt much as to how their efforts have helped to preserve the cultural heritage and transfer it to written form. We were only able to stay at Algeria for two nights. The next day we visited the rock paintings and Stadsal caves, where entrance is by permit only. We lunched at Cedarberg Oasis en route to Algeria campsite on the western side of the Cedarberg, which turned out to be somewhat more crowded. Temperatures generally soared well into the 30’s Celsius. No mercy and no respite. Having transferred from Sandrif to Algeria campsites, we settled on a walk up the valley from Algeria along the Rondegat river, whilst easier than that to Maltese Cross, was nonetheless undertaken in mid-thirty Celsius temperatures, thus presenting something of a challenge. Such was our thirst that we were prepared to drive the 28 km (in both directions) just to lay our hands on a six pack of Windhoek lagers, post the walk. The extent of the severe drought can be seen everywhere. Whilst revellers are able to bathe in the waters passing by Algeria campsite, the levels in the Clanwilliam Dam show the reality of the Western Cable’s water shortage. 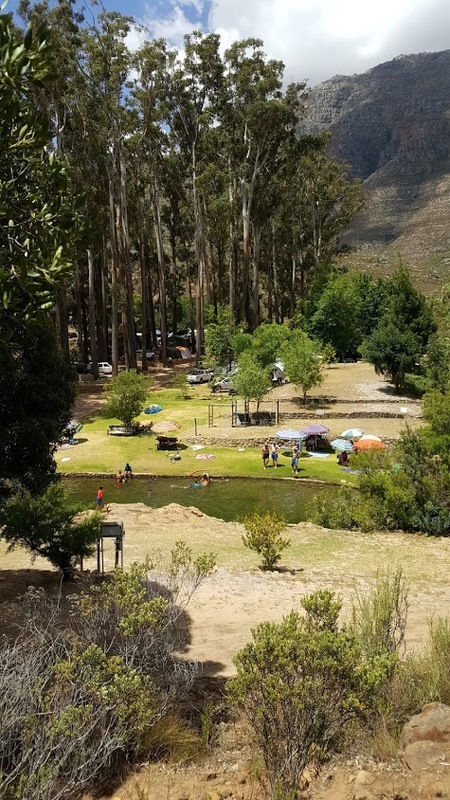 We were lumped with rather interesting campsite neighbours, a collection of families from the Cape Flats. Boisterous to begin with, they did tone noise levels down a tad after a day. This coincided with the subsequent removal of a zip-line which had attracted all the kids in the campsite. Despite having our tranquillity shattered somewhat, the Cedarberg remains a special place of real beauty. A howling southerly wind tore through the campsite on the final evening, threatening to levitate the tent I was sleeping in. Ralph was safe in the camping utility perched on the roof of his bakkie. A leisurely drive back the following morning saw us characteristically stop for lunch at Kardoesie, a restaurant on the Piekenierskloof Pass along the N7 outside Citrusdal, West Coast. Early morning spent with my good friends Ian Forbes and Lily Forbes in the Bohemian Cape Town suburb of Kalk Bay, including an early swim in the Atlantic seaboard tidal pool, popular with the locals brave enough to venture into the chilly waters. The early start did not sit well with me, unable to come to my senses entirely. After a coffee at a Kalk Bay bistro, then picking up panini at the Olympic Cafe, we returned to Tokai for breakfast on the patio. Ian and Lily have also created a lovely feinbos garden at their home. Prior to my moving to the United Kingdom I was referred to and effectively still am their “backside” neighbour, a term I have always accepted as one of endearment. I’d been treayed to a lovely fish braai in their company the previous evening, during which time we catch up on events that have consumed our respective livrs in the past year. Despite feeling queasy the day before due to a stomach virus, I felt the strength to participate in a planned walk along the Pipe Track, Table Mountain below Twelve Apostles, which follows the Atlantic shoreline on Camps Bay. 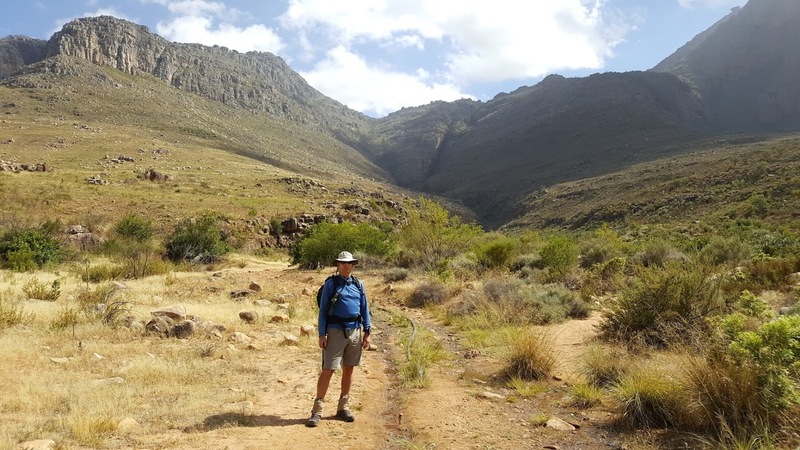 Whilst the path itself does not involve any ascent to the summit of the mountain, access routes en route include Diagonal, Kasteelspoort and Woody Ravine. Contrary to what one might imagine, the path is not entirely flat, rising gradually as on heads towatds Bakoven; nevertheless, it’s pretty straightforward and easy. Ideal conditions greeted us at the outset of the walk, despite the low cloud shrouding much of the landscape. Inspired by our walk via Constantia Nek a few days earlier, my eldest brother, Ed, dispensed with the greenbacks to invest in a new pair of boots for our subsequent outing in Silvermine Nature Reserve. Owing to temperatures expected to be in the 30’s, we agreed to make an earlier start. My usual route for many years was a walk to Elephants Eye below Constantiaberg, on the edge of Silvermine however with this route shut after fires had rendered it potentially dangerous, other options were now on the table. The area is a significant conservation area for the indigenous fynbos vegetation. Walks up Table Mountain at the height of summer under the African sun are particularly difficult to pick out when the participants happen to be two of my elder brothers, one in his mid 70’s and the other on the cusp. It’s not that I think that such walks are beyond them; it’s simply that I have to bear in mind that they are not regular hikers like me. One has had an operation just recently yet I need to pinch myself to remember this. There’s no point dragging them up the most challenging route the mountain has to offer. It was probably for pragmatic reasons that I chose a path walked just two weeks ago just after my arrival in Cape Town on holiday, along the jeep track from Constantia Nek. Accompanying me were Edward and John, along with brother-in-law Horst-Werner Boehmcker, recently retired from BMW in Munich. Brother Gordon was not able to join us. It was perhaps a blessing that a fair wind was up by the time we set off at around 9h00 as this had died down by the time we headed back. I was proud that they both made it to the top, an overall climb of some 800 metres. We reached Woodhead Reservoir where we indulged in the sandwiches I had prepared for the outing. All marvelled at the sheer splendour of the mountain landscape, vegetation and views. Unwinding with a beer at the Constantia Nek restaurant proved a fitting end to a memorable day. Today’s walk in the Cape Peninsula on Table Mountain, just off the road between Hout Bay and Llandudno, behind the Ruyterwacht Estate. Previously, it’s a route I’ve always descended after first walking up the valley from Hout Bay towards Constantia Mel and then navigating up the Myburgh Ravine waterfall, with a bit of a scramble on the upper section to emerge at the very top into more exposed landscape. But back to the present. Recent fires higher up the mountain at this corner above the block house and along Twelve Apostles towards Bakoven meant that I couldn’t actually find the route to the very top and had to turn back. Upon returning to my car, I encountered an English couple who had a similar experience. It was a frustrating climb but rewarding nonetheless. Another super walk today with an unexpected twist. Set off from Rhodes Memorial car park towards the block house below Devils Peak, a remote spot with a reputation for muggings, if what an elderly hiker said as she passed me by was anything to go by. As I approached the hill I saw a van parked nearby and three women sitting on camping chairs being served by a guy wearing an apron. “Would you like to try some wine”, he said. “We’ve been waiting for you”, they added, in reference to the possibility of some hiker passing them by. A snack comprising a slice of baguette topped with cheese and biltong was being offered and before I knew it, my glass was being refilled. I couldn’t believe my good fortune. I’d unintentionally gate-crashed an official Table Mountain wine tasting safari organisdd by Durbanville Hills. Not wishing to overstay my welcome, I bade the jovial hosts goodbye and set off along the contour path hugging Table Mountain, towards Newlands, where I descended to a lower jeep track back to Rhodes Memorial car park. Gorgeous walk today along the jeep track from Constantia Nek corner to the reservoirs on Table Mountain. Views across the southern suburbs of Cape Town and across False Bay. The Cape Floristic Region is an area of extraordinarily high diversity and is home to over 9,000 vascular plant species, of which 69 percent are endemic.